Enjoy the honeyed fragrance of hand-dipped 100% pure beeswax candles! The mellow glow of candles helps us slow down and connect with each other. They provide light, a gentle scent and a touch of peace. Candles warm a room adding a welcoming feel. They take a meal from functional to special. Our candles combine beauty and function to make a wonderful addition to any occasion. They go from cosy to spectacular, depending on the context. They make a perfect gift or enhancement to any celebration. Hand-dipping is one of the oldest and most hands-on methods of making candles. By hand-dipping the craftsman coaxes each set of candles to take form gradually, making adjustments along the way to ensure the best product possible. Each batch is unique, taking on minor variations based on changes in the the wax, the surrounding environment and even the mood of the person dipping. The candles are produced by hand in small batches using 100% beeswax from regional beekeepers on 100% cotton wicks. Most of the tapers produced are 12 to 14, but other sizes are possible upon request. Beeswax is the only naturally occurring wax. It is one of the most desirable materials for candle making because it burns slowly and emits a gentle honeyed fragrance. Each batch of beeswax has its own unique scent, a prized combination of the flowers and plants that fed the bees that produced it. 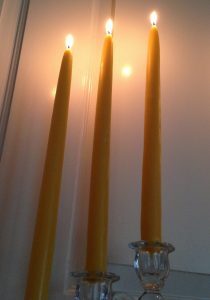 Beeswax candles last longer, are naturally drip-less and help purify the air. 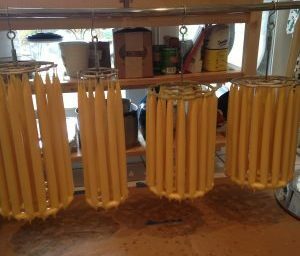 100% pure Beeswax candles, unlike other candles, do not require any chemical additives. Burning them does not emit toxins or soot into the air. In fact burning 100% pure beeswax candles releases negative ions which helps to clean the air of indoor pollutants and allergens. Finally, by using beeswax we are supporting beekeepers who are helping to maintain and rebuild the American honeybee population which is essential to our plant and food production.